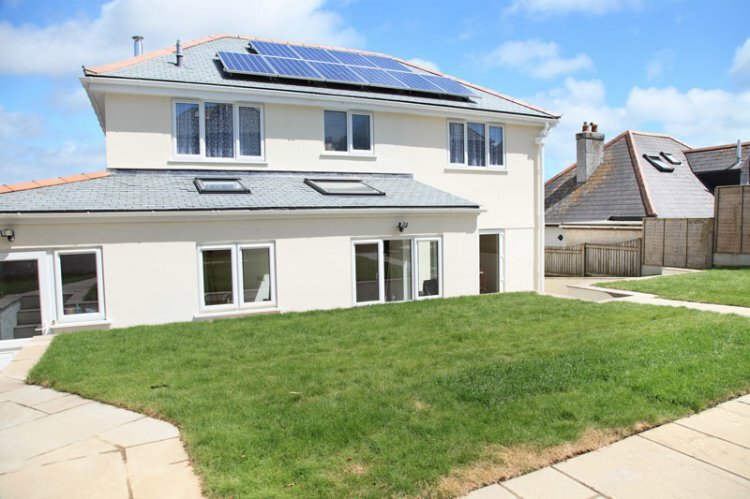 A large four bedroom (one en suite), three bathroom property with views out to Falmouth docks and sailing waters of the Carrick Roads. Falmouth town centre is around a 10 minute scenic walk where you'll find many restaurants, cafes, pubs and shops as well as the Maritime Museum and there's often events taking place through the year. Groundfloor: King-size room with en suite bathroom and shower over the bath. Separate wet room with shower, toilet and handbasin. Twin room with two x 3' single beds (these are zip and link beds and can be converted into a 6' bed upon request). Dining room, kitchen and utility. First floor: Lounge with two three-seater sofas, woodburner, large tv and DVD player. Separate sun room with two reclining armchairs and views over towards the docks. Family bathroom with shower over the bath, toilet and handbasin. Two further bedrooms with king-size beds, wardrobes and bedside tables with lamps. This property is reverse level to take advantage of the views, large kitchen/breakfast room, separate dining room. Separate utility area with toilet, two washing machines and two dryers. From the kitchen and dining room you can access the patio area with a large picnic bench and brick built BBQ. A few steps lead up to the lawned garden. Please be cautious with children as the garden is at a raised level from the house, as shown in the outside photo. Walking distance to Falmouth town centre and on-road parking is usually available. Wifi is available at the property. Owner will accept two well behaved dogs. A travel cot and a highchair are available. Extremely eco-friendly with fully automatic rain harvesting system and PV Solar Panels.